I know how it feels to be on a strict budget. We are a family of nine, with many different food allergies. When I first heard of the Ketogenic diet, I thought it was only for those with a disposable income. To be honest, you do hear many people who say you need the finest, most expensive salmon, special oils and protein powders, fancy bone broths etc. 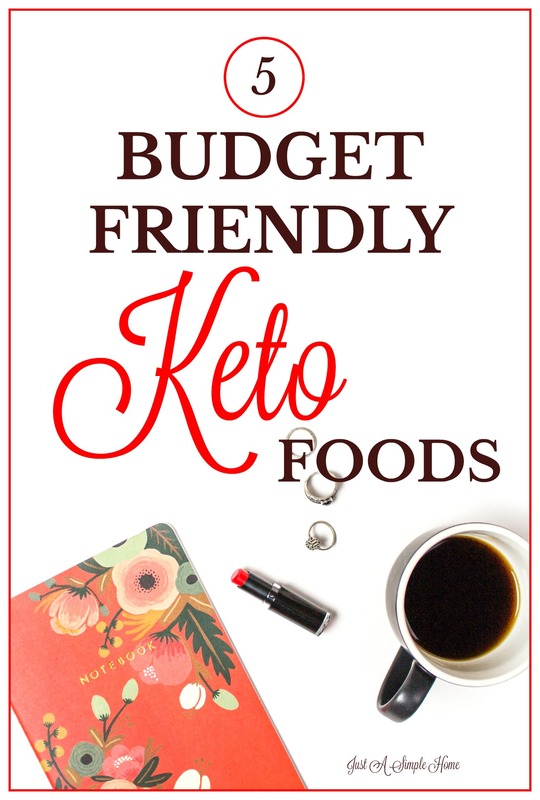 While those things are all amazing for anyone following a Ketogenic lifestyle, they aren’t always in the budget. I firmly believe that anyone can follow a Ketogenic lifestyle if they want to. The cost of food shouldn’t prohibit you from getting healthy. You can follow a Keto diet and still maintain the family budget. Just focus on the basics – high fat, very low carbs. CHICKEN LEGS- While not the fanciest cut of meat, chicken legs are a good source of fat as well as protein. You can eat them on their own, but better yet, cut off the meat and use it in other recipes. Use the bones to make a quality bone broth with a few spices and you will reap those benefits. GROUND BEEF – Ground beef is obviously higher in fat than ground chicken or turkey. Now, you do want to get the beef with the higher fat content, which also happens to be the cheaper option. Ground beef may have some added fillers or preservatives, I get that. If you can buy organic, do it! But I am trying to save you money here and to be honest, consuming the cheaper ground beef is still a better option than the standard American diet. EGGS- Eggs are a staple on the Ketogenic diet. The media goes back and forth over the idea of eggs being good for you or not. Do your own research! I eat eggs on a daily basis. Thanks to Aldi’s, I can get a dozen eggs for less than a dollar. You can hard boil eggs for a snack and they are a good source of protein. Eggs can also increase the fat content of other recipes, so get creative! AVOCADO- I know these aren’t always cheap, but they are coming down in cost! I buy them when they are 99 cents and I know other areas can get them even cheaper. I use avocado daily – with my breakfast eggs, as a condiment on my lunch meat, to thicken soups like starch, chopped with some mozzarella and tomatoes. GREENS- While green aren’t a good source of fat, they are extremely good for your body. There’s so many benefits to adding greens to your diet, Ketogenic or not, that they really are a must have. Greens like collards, kale, and spinach are so versatile they can be added to many recipes for a boost of nutrition. Saute your greens in bacon grease and you have Keto friendly greens! I love cooking spinach in bacon grease, and adding some olives…So good! You can make thousands of recipes using these simple ingredients. The possibilities are really endless with a little imagination. Don’t let cost prohibit you from a Ketogenic lifestyle. It will change your life for the better! I HAVE A FREE COMMUNITY FOR MOMS TO LEARN MORE AND GET SUPPORT ON THE KETO JOURNEY. CLICK THE PHOTO TO JOIN US!